Ahead of the Kumbh Mela from January-March 2019 at Prayag, the tanneries have been asked to shut down to stop discharge of effluents into the Ganga. The industrial town of Kanpur is still known as the 'Manchester of the East', although most textiles mills have downed shutters. Now, Kanpur's other well known industry -- leather -- is also staring at the possibility of turning sick. Environmental issues coupled with raw hide bottlenecks over the past decade have pushed the leather industry, which provides direct and indirect livelihood to a million people, to the brink. The tanneries, which used to run at peak processing capacity of almost 15,000 hides a day, operates at half capacity in the traditional Jajmau leather cluster due to continuous sickness. Some leather goods manufacturers have even started importing finished leather from other countries, including Brazil, Pakistan and Bangladesh, to maintain their supply chain and hedge against occasional shutdown of tanneries. Small Tanners’ Association member Nayyar Jamal said that the local tanneries were facing a bleak future as there was still no concrete action plan of the government to keep the industry afloat as it transitions to a more eco-friendly platform. These industries battle forced closures during events like Kumbh Mela in Allahabad and due to the National Green Tribunal orders. 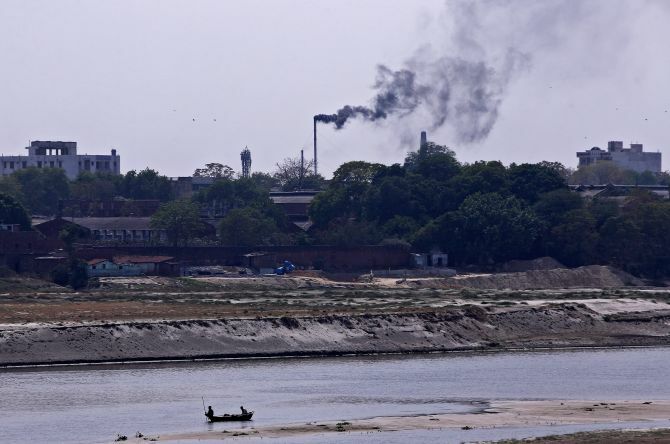 He said although tanneries have been advised to shift to the proposed new leather cluster in Ramaipur, where a much bigger effluent treatment plant would be set up, the new facility remained a non-starter. "The proposed leather cluster in Ramaipur is not ready and we are expected to shift from Jajmau. It is for the government to set up the effluent treatment plant and we are ready to pay the user charges, which we continue to pay. "If the Jajmau treatment plant failed to meet the tougher environmental norms, why are we made to suffer," he noted. Levies on processing had also been increased from Rs 5.70 to Rs 20.35 per raw hide. A large number of tanneries closed down following the NGT order to curb pollution. The remaining tanneries have been asked to shift to Ramaipur, where a modern treatment plant is proposed at an investment of Rs 5.54 billion. Currently, about 250 small and big tanneries operate in Jajmau, while more than 130 had already shut down. The existing tanneries discharge about 6.7 million litres per day (MLD) of effluents. Kanpur leather cluster, which also includes the nearby Unnao district, has estimated annual sales of Rs 120 billion, including Rs 60 billion worth of exports to the Gulf, Europe, China and Iran, among others. Uttar Pradesh comprises three major leather industry hubs viz. Kanpur-Unnao, Agra and Noida. Of the Rs 200 billion (annual) leather industry of UP, about 50 per cent is accounted for by the export market. The state accounts for almost a third of India’s annual leather trade and exports. UP Leather Industries Association member Taj Alam lamented that Kanpur’s leather industry was fast losing its sheen as a reliable supplier owing to frequent supply crunch and government policies that reek of unfavourable policy stance. "The importers have the ready option to procure from Pakistan, Bangladesh, Vietnam, China and Brazil, where there are no supply issues regarding cattle hide," he said. He said once an importer decides to source elsewhere, the whole import basket would suffer as he would question the 'Made in India' theme of the government. Against the backdrop of the upcoming Kumbh Mela during January-March 2019 at Prayag, the tanneries have been asked to shut during December 15-March 15 to stop discharge into the downstream Ganga meandering towards Allahabad. The 3-4 months closure during December-March would also deprive the industry of the arbitrage accruing from the devaluation of the rupee. Also, it would impact imports worth over Rs 40 billion, since the effective closure would be more than the mandated three months. These units would have to be shut 10-15 days in advance to ensure there is zero discharge. Under the Namami Gange and National Mission for Clean Ganga, both the central and state governments have reiterated that Ganga must be set free of all pollutants and discharge by 2022. Of the total projects worth over Rs 200 billion under MNCG so far, the Centre has approved projects worth almost Rs 90 billion for UP alone. Recently, UP Chief Minister Yogi Adityanath had announced that no effluent would be allowed into the Ganga after December 15. Did NDA govt help Vedanta's Tuticorin factory?